Attia Hosain’s only novel, first published in 1961 is a classic novel of Muslim life, portraying the traditional feudal society into which Attia Hosain was born, in pre-partition days. Set mainly in Lucknow of the 1930’s, Sunlight on a Broken Column centres on Laila, the orphaned daughter of a distinguished Muslim family. As the novel opens fifteen year old Laila is living in her grandfather’s house, brought up by her two aunts, who observe purdah, alongside her cousin Zahra. Zahra is frivolous yet happy to submit to the traditional life mapped out for her, as the novel begins conversations around Zahra’s marriage have already begun. Baba Jan, Laila’s grandfather is a formidable figure, hugely respected the entire household is run around him, he is old and ill as the novel opens, and his eventual death brings change for Laila. Soon Laila is living with her uncle Hamid – a “liberal” though a cold and autocratic figure. As Laila grows up and starts to attend university – she is surrounded by a variety of people; politics is very much on the agenda for many relatives and friends, though Laila herself is unable to commit herself to any one cause, but that of her own freedom. Uncle Hamid’s more liberal household, and Zahra’s marriage allows Laila access to a society that unmarried girls traditionally didn’t experience. In the younger generation of Laila’s friends and relatives we are able to see something of the future of India and the changes that are on the horizon. While in the characters of Laila’s aunts, Aunt Abida in particular, Attia Hosain has portrayed the traditional self-sacrificing obedient role that Laila struggles to understand. Laila is a girl with a strong spirit – her struggle for her own independence matching that of India herself. Hosain portrays the claustrophobia of this world and frustration felt by a forward thinking young woman to perfection.Brought up in a world where the traditional rules of obedience, honour and dishonour are more important than personal happiness and the feudal society is still controlling the lives of the servant class, Laila begins to pull against these traditional ways. Laila is horrified when ignorance prevents a servant woman’s family seeking medical help – desperately trying to save the woman Laila sends her to hospital – only it’s too late. In these “Taluqhdari” families – into which Attia Hosain herself was born in 1913 – the rules for the servant classes are just as harsh, maybe more so, the judgments upon a female servant seduced or preyed upon by a man, abysmally cruel. The conclusion of the novel – is brilliant – as through Laila’s older eyes we see the changes that partition brought to families of this kind, the fracturing of households and the ending of a way of life. 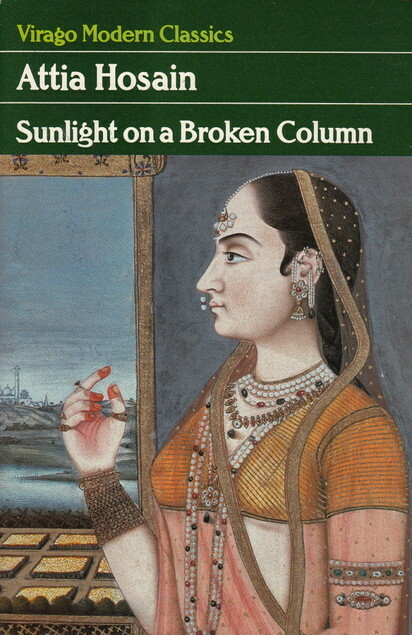 Sunlight on a broken Column is an engaging and evocative story of traditional family life in the decade before partition ripped India apart. I am not sure how well this novel is known now, but it certainly deserves to be well known. I have enjoyed reading this novel so much, – and very much look forward to hearing how Liz and Karen – who have been reading this novel at around the same time as me – feel about it. I really now need to find myself a copy of Attia Hosain’s short stories, what a shame she only ever wrote one novel. Lovely review Ali – you’re right, this book does deserve to be better known. I am enjoying very much – my review will follow eventually!! do you happen to have a copy of this book by attia hosain? This does sound good, and you have me curious to read an author who came a little before others whose books about India I have enjoyed. I think this be at least partly autobiographical which does make it interesting I think. And here’s my review http://librofulltime.wordpress.com/2014/03/21/book-reviews-103/ I really enjoyed it too, and it’s nice to read your thoughts on it. Glad you prompted me to read it.